Osteosarcoma, in it's classical intra-medullary type, is a highly malignant metaphyseal bone tumour which rapidly spreads to the periosteum and the surrounding soft tissues. It is more common among children and adolescence, especially around the age of 15-25 years old. Most commonly affects the long bones around the knee joint, for eg : distal end of femur, proximal end of tibia, and proximal end of humerus. As mentioned, it is a intra-medullary bone tumour, which involves local destruction of normal bone, and formation of new abnormal bones. Sites where there is bony destruction usually appears as cavitations, alternating in between patches of abnormal bones. The tumour extends within the medulla and through the epiphyseal plate. As the tumour extends and involves the surrounding soft tissues, there will be new bone formation in the form of streaks, radiating out from the cortex, giving rise to an X ray appearance, known as "Sun-burst" appearance. And with new bone formation at the angle of periosteal elevation, it forms a "Codeman's Triangle", which is visible through X ray. Microscopically, it is highly variable, which may consist of characteristic spindle shaped cells, with pink-stained osteoid matrix, or just fibroelastic or cartilaginous cells, with little or no osteoid matrix. The first symptom is usually pain, which is constant, worse at night and gradually increase in it's severity. Or patient can present with bony swelling. About 10 % of the patients upon presentation, there are features suggestive of pulmonary metastases. On examination during early stages, other than tenderness at the site affected, there is no other finding. Later stages, there might be a palpable mass, which the skin overlying it may be swollen, or inflammed. 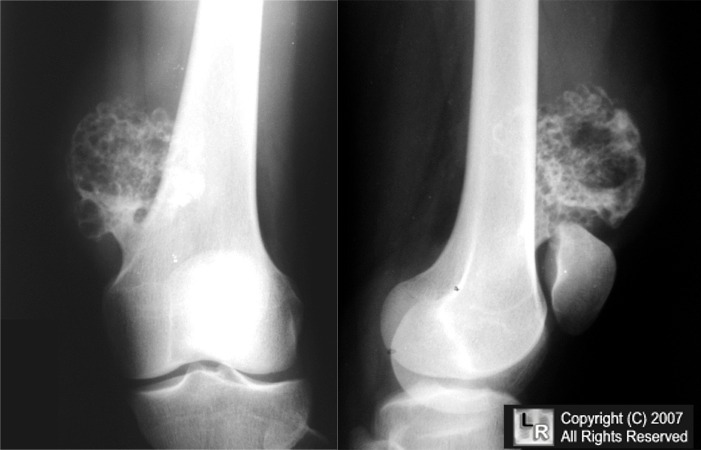 A confident diagnosis of Osteosarcoma can be made through X ray. X ray appearance varies in between hazy lytic areas and dense osteoblastic areas. The endosteal margin is poorly defined. The characteristic 'Sun-burst' appearance and 'Codeman's Triangle' may be seen. 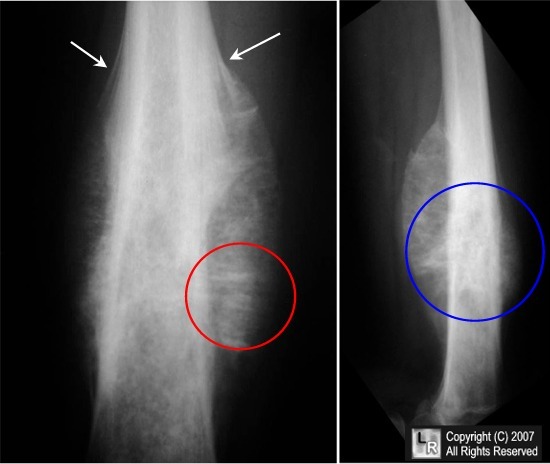 Though the above two appearance are features of Osteosarcoma, but they can be present in other rapidly growing bone tumour as well. From X ray, d/d such as post-traumatic swellings, infection, stress fractures and aggressive cystic bone lesion need to be ruled out. Other imaging modalities are done for staging purposes. If radio-isotope bone scan is done, there might be skip lesions. Chest X ray occasionally reveals cannon-ball metastases, but CT thorax is more sensitive. CT and MRI is usually done to know the extent of tumour in bone and soft tissues. During pre-operative and post-operative period, chemotherapy is given. Usually in combination of Methotraxate, Endoxan, Citrovorum factor and Cisplatinum. Then during early stages, a limb saving surgery can be done with radical resection, reconstruction, joint replacement and arthrodesis. However, in later stages, limb ablation surgery can be done but the patient will need to wear an artificial limb for the rest of his/her life. Proximal end of humerus : Forequarter amputation. In such cases, prognosis is good. Refer patient for CT thorax evaluation. If CT thorax shows that there is only single metastases, resection of the secondaries and treatment is given as in a). However, if CT thorax shows that there is multiple metastases, only palliative tumour ablation with chemotherapy to improve the quality of patient's life can be offered. Ewing's tumour is believed to arise from the endothelial cells of bone marrow. Such tumour is classically seen in patients aged 10-20 years old. It usually affects long bones in 2/3 of the cases (esp. tibia and femur), but in 1/3 of the cases it affects the flat bones, for eg : pelvis or calcaneum. It can affect any site of the bone, but especially the diaphysis. It presents as a lobulated mass, which is grey in colour (resembling brain substance) or if haemorrhage has occur within it, it appears red. Microscopically, a sheet of spindle-shaped cells, with no regular arrangements and no ground substance is seen. But occasionally, these cells arrange themselves around a central clear area resembling a 'pseudo-rossette'. Typically, patient presents with pain, usually throbbing in nature, swelling. There is usually generalised illness and some constitutional symptoms such as fever, malaise, anorexia and etc. The swelling is usually tender, redness over the skin, and warm, resembling osteomyelitis. Blood investigation may reveals elevated levels of ESR. From an X ray, a bone destruction is demonstrated, but in contrast towards Osteosarcoma, the lesion is located at the mid-diaphyseal region. New bone formation may extend along the shaft, forming fusiform layers of bone surrounding the lesion, giving rise to an "Onion-peel" appearance. Though both Sun-burst appearance and Codeman's triangle are features of Osteosarcoma, but they may be seen in Ewing's tumour as well. Tumour despite being radiosensitive, but radiotherapy doesn't enhance the overall survival rate. Current management guideline includes pre and post-operative chemotherapy given, with wide excision if the site is accessible, or radiotherapy followed by local excision is the site is inaccessible. Post-operative chemotherapy is given for 1 year. Chemotherapy regime : Adriamycin, Cyclophosphamide and Cisplatin, given every 3-4 weeks in 8-12 cycles. 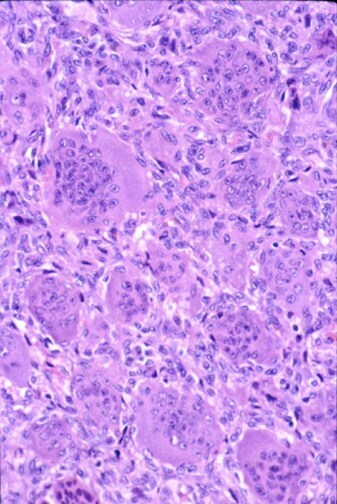 Giant cell tumour is a common bone tumour with unknown cell origin, with varying growth potential. Though it is classified as a benign tumour, but occasionally it may be locally aggresive. 1/3 of the cases - benign, another 1/3 - locally aggressive, and the remaining 1/3 - frank malignant. Age of presentation is usually around 20-40 years old. It typically affects the long bones around the knee joint, at the epiphyseal region (at the site where epiphysis has fused with metaphysis). Another common site is at the lower end of radius. Patient usually presents with swelling and vague pain, which is usually neglected initially. Later, it may complicates as a pathological fracture. On examination, a bony mass may be palpable, which is smooth, tender on palpation. There will be limb deformity is patient presents with pathological fracture. Microscopically, there are sheets of spindle shaped cells profusely dispersed in between multinucleated giant cells. These giants cells are previously thought to be osteoclast, hence the name 'Osteoclastoma'. The remnants of the trabeculae of the bones traversing through the lesion, giving rise to this classical appearance. Since this is a locally aggressive tumour, other means of imaging is done for staging purposes. CT for bony extension, MRI to check the extent of tumour involving the soft tissues. Since it's an epiphyseal tumour, it may invade into the adjacent joint. Hence, athroscopy is done to rule it out. Biopsy is required to confirm the diagnosis, usually done as frozen section before the operative treatment commences. If the lesion is well-confined, slow growing and has benign histological appearance, extensive curettage is done. Followed by stripping of the cavity using burrs and gouges, and swabbing the site with liquid nitrogen or hydrogen peroxide. And lastly filling the gap with chips of bones. If the lesion is aggressive, or it's a recurrent lesion, then wide excision of the lesion is required, with bone grafting or prosthetic replacement done. In case the tumour involves the spine or other inaccessible areas, radiotherapy can be attempted. But there is a small risk of malignant transformation. Osteochondroma is not a true neoplasm, since upon cessation of the growth of epiphyseal plate, and tumour stop growing. It is believed to be due to aberration of growth of the epiphyseal plate, where a few cells grows centrifugally, as a separate lump of bone. The swelling arises from the metaphyseal region of the bone. The tumour has a stalk, and part of the head is bony while the other part is covered or capped by an articular cartilage. Patient usually present with a painless swelling around a joint, most commonly the knee joint. The lump has all features of a benign swelling, arising from the metaphyses. It may be pedunculated or sessile, with usually has features of complications secondary to the tumour. For eg, pain due to bursitis at the tip of swelling, or even fracture of the exotosis. Others include restricted mobility due to mechanical factors and neurological symptoms (lump compressing on neural bundles) such as tingling and numbness. However, a patient with a previously painless lump, presented with sudden onset of pain or rapid enlargement of the lump, a malignant change should always be suspected. It's radiological appearance is pathogonomic. An exotosis clearly seen arising from the metaphyses, where the size is usually smaller as compared to clinical palpation, since the cartilage cap is not visible on X ray. However, in long standing cases, the cartilage may have undergone degenerative changes and calcification, hence clouds of calcified materials are seen around the exotosis. Treatment? - Excision if symptommatic.